The Historic Barns of Nipmoose, comprised of the Scottish Barn, German Barn and Corn Crib, are extraordinary examples of early timber framed structures. The story of the Historic Barns of Nipmoose harks back to the 18th century when the Nipmoose Farm was first established, in a region known at the time as the Wanepimoseck Valley. Named by the Mohican Indians, the valley encompassed parts of Buskirk and West Hoosick in northern Rensselaer County, New York. The Nipmoose Farm derives its name from the Wanepimoseck Valley, as does the Nipmoose Creek which runs along the farm’s border and the Nick Mush Road, which leads to the farm. According to the earliest records, the Nipmoose Farm was sold by Ebenezer Darling to Abram Viele in 1799. Soon thereafter the farm was purchased by Barnabus Clapp who held title to it for over 40 years. By the late 1800s, the Shermans had settled on the farm. The Sherman family lived there continuously for a century. The roadway leading to the farm is named after the Shermans. The Nipmoose Farm was first established as a subsistence farm. Timber was cut, fields were cleared, and structures built. Farm animals, vegetables and crops would have been just sufficient in numbers to sustain the family. Subsequently, crops were cultivated and livestock raised for sale, as a principal source of income. By the early 1900s, the farm had been transformed into a dairy farm, as was typical of other farmsteads in the region. 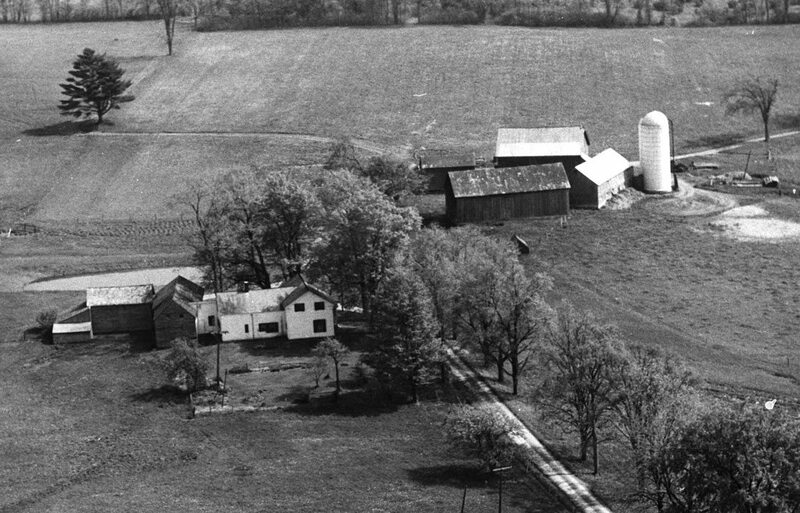 The numerous buildings, which can be seen in the 1960s aerial photograph above, are witness to the evolution of the farm. A host of structures can be seen that once supported an assortment of agricultural endeavors. While no records have yet been discovered which verify when the barns and house were first built, some information can be gleaned from the buildings which are still extant. Both the Scottish and the German barns reveal evidence of having been moved. It remains a mystery as to whether they were transported from miles away or simply relocated on the farm. Their dates of construction (Scottish Barn 18th century, German Barn 19th century) differ vastly as well as their building styles. But they both were re-built to support new initiatives on the Nipmoose Farm. The Scottish Barn would have served as a thrashing barn, providing storage for crops. There was room as well for six milk cows. The German Barn was altered, after it was moved, to provide space for a dairy herd of about thirty cows. The modest story and a half farmhouse was built circa 1800. Since the farm was established prior to that date, the house must have replaced an earlier dwelling. Long term plans of The Persistence Foundation (TPF) include restoration of the farmhouse. When TPF first purchased the farm in 2000, several structures were still extant. All of them, however, were in very poor condition. Because of the historic integrity and unique qualities of the Scottish and German barns, they were singled out for restoration. The Corn Crib, another significant historic building, was located on a nearby farm. The Hadley family donated it to TPF. The Corn Crib (built circa 1820) was then disassembled and brought to the Nipmoose Farm in 2002, where it was restored and resurrected. The Workshop Barn was built by TPF to facilitate the restoration work on the three barns. It has been used for carpentry, timber framing and repairs, and most recently, as a space for caterers when servicing events. To learn more about a barn’s history, construction and restoration process, please visit one of the follow pages: Scottish Barn, German Barn, Corn Crib. The Nipmoose Farm’s land (123 acres) includes sloping fields, woodland, conserved wetlands, an apple orchard, poplar grove and flower garden. A pond is positioned near the barns, and the Nipmoose Creek flows along the west boundary line. By the mid 1900s, the Shermans had sold their cows, and the land was leased to neighboring farmers. Currently the farmland is tilled by the Ziehm family, owners of the Tiashoke dairy farm in Buskirk. The Ziehms have undertaken to improve the soils and drainage in partnership with TPF. For more images of the farm and the historic barns, please visit the Nipmoose Farm Gallery. Site Map & Credits | Copyright © 2010-2019 Persistence Foundation, Inc. All rights reserved.